Do you have Tooth Fairy trouble at your house? Do teeth sometimes fall off the bed before she arrives? Or, are your kids such light sleepers that the Tooth Fairy can’t seem to find their teeth without waking them up? Do the kids sometimes wake up to find their tooth gone, but the money nowhere to be found because it fell on the floor or behind the bed? 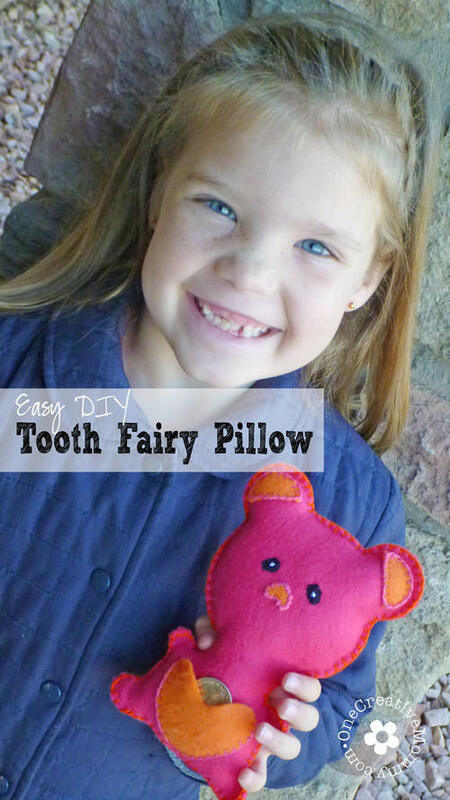 I’ve got an easy solution for you that the kids will love: an easy DIY Tooth Fairy Pillow! No more lost teeth or lost coins! Go online and find a simple shape you’d like to use for your pillow. I used a really simple outline of a bear. (I would recommend choosing something with larger hands and feet. The hands and feet on mine don’t hold the stuffing very well, so they are pretty flat. The kids don’t mind, though.) Find a clip art image and enlarge it as much as you can on an 8.5 x 11 sheet of paper. 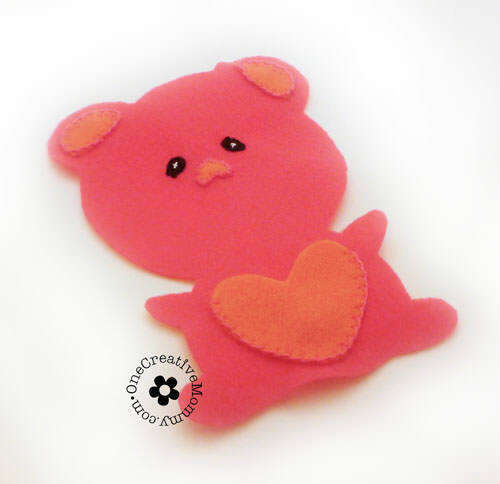 Trace and cut out the basic body shape on two pieces of felt. 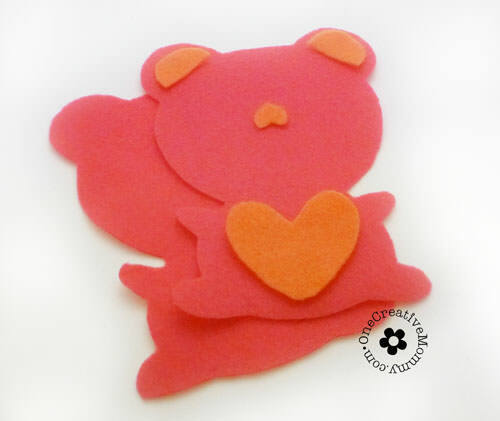 Cut out a heart and other embellishments on a coordinating color of felt. 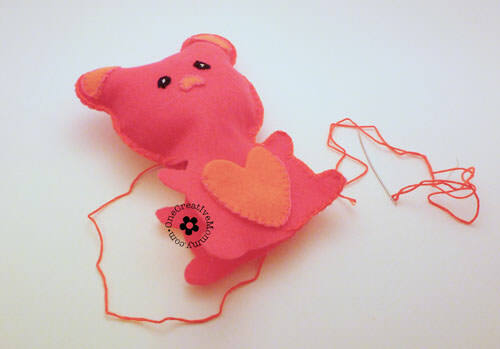 Lay the two body pieces of felt on top of each other (wrong sides facing in–you will not be turning this inside out). Using a basic blanket stitch, sew two-thirds of the way around the outside edge of the body (leaving a hole large enough to add stuffing). Stuff the body with batting, fabric scraps, or whatever you have on hand. Seal the hole by continuing your blanket stitching. 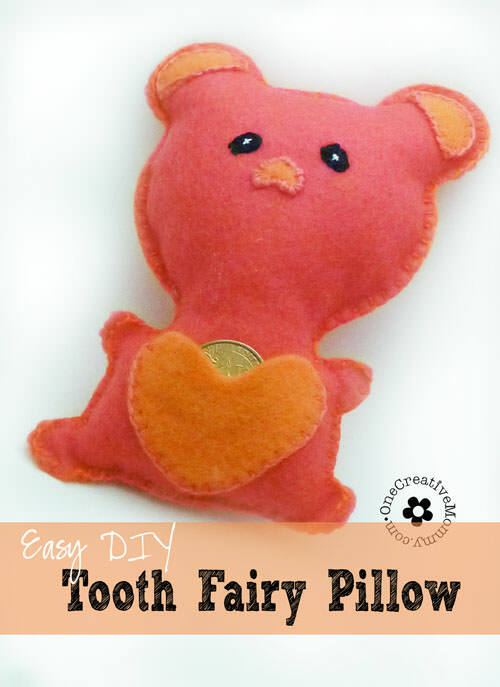 Your Tooth Fairy Pillow is done! Now, here’s the best part . . . Let your child put his or her tooth inside the pocket (we put ours in a baggie first). Place the pillow somewhere in the bed where the Tooth Fairy can easily find it. In the morning, the tooth will be gone, and the Tooth Fairy will have left something special in it’s place! 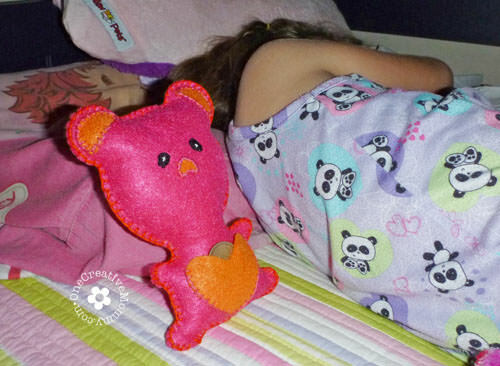 Because we want the Tooth Fairy Pillow to be something special, it only comes out when someone has lost a tooth. The kids are always excited when they get to use it. So what’s your best Tooth Fairy mishap story? My oldest once searched all morning for her coin, only to find it later in her shoe! Clumsy Tooth Fairy! Thanks for stopping by today! I hope you’ll be back soon. I have been looking for a tooth fairy pillow for my son! Most are too girly, but this would be easy to change the colors and make it appropriate for a little boy! Thanks. Glad you like it, Brenna! You could easily make a “boy” pillow. Thanks, Cari! If you can sew a blanket stitch, or even just a whip stitch, you can do it! Too cute! My grandson lost his first two teeth not too long ago. This would be a great thing to make him and the other grandkids too. Love, love, love! I (oops, I mean the Tooth Fairy) made a little bag for my son but I love this idea and I have to make one for a friend’s daughter. I’m so taking this idea (hope you don’t mind). I don’t mind at all. I’d love to see how it turns out! What a nice sister you are, Kelsea! I hope they love it.